Facebook is one of those brands that has become a household name, not just in the United States, but around the world. However, there has been quite the debate surrounding the stock as of late. Some argue that the company has reached such a massive portion of the market that it’s going to be incredibly hard to grow from here. Others argue that we’re just seeing the beginning of the FB growth story. Personally, I’m on the just seeing the beginning side. One of the biggest reasons for this is the fact that Facebook is constantly working to grow, whether they are growing users or growing revenue. For example, there was a recent report that shows that FB is working on the revenue growth side of the equation at the moment. Today, we’ll talk about the company’s plans and why we can expect to see incredible growth out of FB moving forward. Facebook Has A Plan For Growing Revenue! When it comes to Facebook, we’re talking about a company that is a revenue growth artist. Every time I’ve had doubts about the company’s ability to drive revenue, those doubts have proven to be unwarranted. Time and time again, FB proves its ability to drive more revenue, and they’re doing it again. When it comes to Facebook, we see ads on the social network, on the mobile app, and more. However, recently leaked documents show that the company is looking to drive further revenue from mobile, in the one place that we’re not seeing ads quite yet. FB is looking to bring ads to the mobile messenger app. To give you an idea of just how big this is, Facebook’s mobile messenger app currently has 800 million monthly active users. That is a massive audience and gives this idea huge potential for growth. The plans to monetize the mobile messenger app are Facebook’s most recent way to grow revenue. However, there’s another, possibly even bigger reason to be bullish on FB. Think about it. Facebook has created an incredible brand for itself. The company started as a private social network. When the private network became public, the user base on the network exploded, and Facebook quickly became the most popular social network online. This was great, but the company didn’t start there. Soon, we started to see instant messaging capabilities, the ability to play games with friends, videos, and more. Over the years, FB grew to be far more than a social network. Today, Facebook has become a way of life for several people around the world. In fact, the company now has more than a billion users and is continuing to grow. Now, the company is branching out even further, while maintaining the social network, the company is focusing on consumer products, most notably virtual reality. All in all, FB is a force to be reckoned with and will continue to grow! Moving forward, I’m expecting to see further bullish activity out of Facebook. The reality is that no matter where or how you look when it comes to FB, you’re going to see overwhelmingly positive news. Strong users, strong revenue growth, strong earnings, great plans for expansion, and a brilliant mind leading the company are just a few of the reasons that this stock is going to soar! All in all, FB is a great company and one that investors are likely to see strong gains from! Where do you think FB is headed moving forward? Let us know your opinion in the comments below! 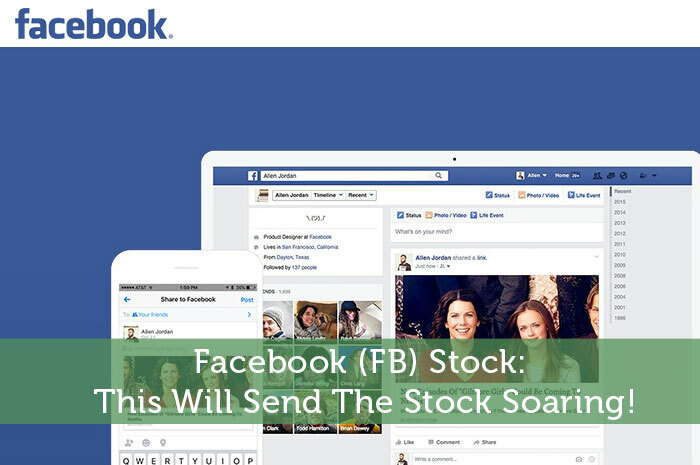 Facebook (FB) Stock: This Will Send the Stock Soaring!